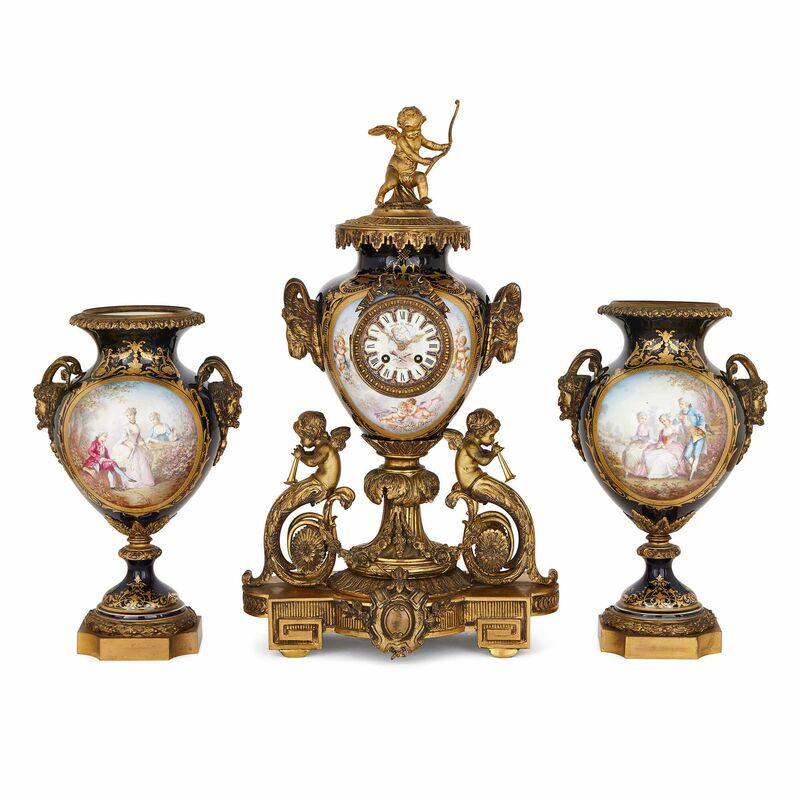 This exquisitely detailed three piece clock set is crafted from intricately painted Sevres style porcelain and mounted with expertly cast ormolu. This three-piece clock set exudes the elegance and exuberance of the Rococo style, which enjoyed a resurgence in popularity from the mid to late 19th Century, when this work was created. 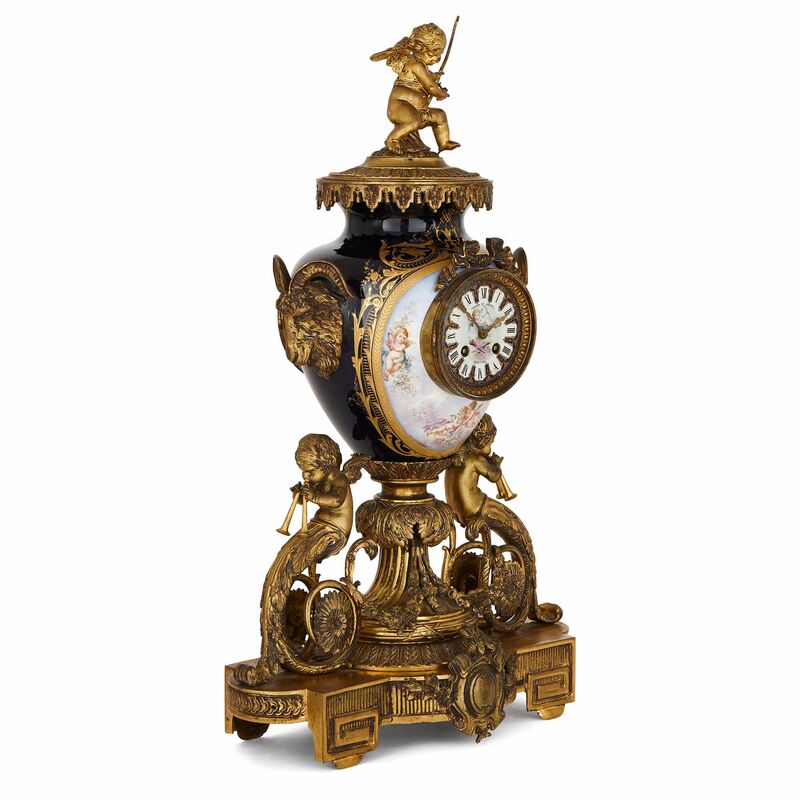 The clock set comprises a central clock and a pair of flanking vases, which are all crafted as three large ovoid vases decorated in a complimentary fashion. 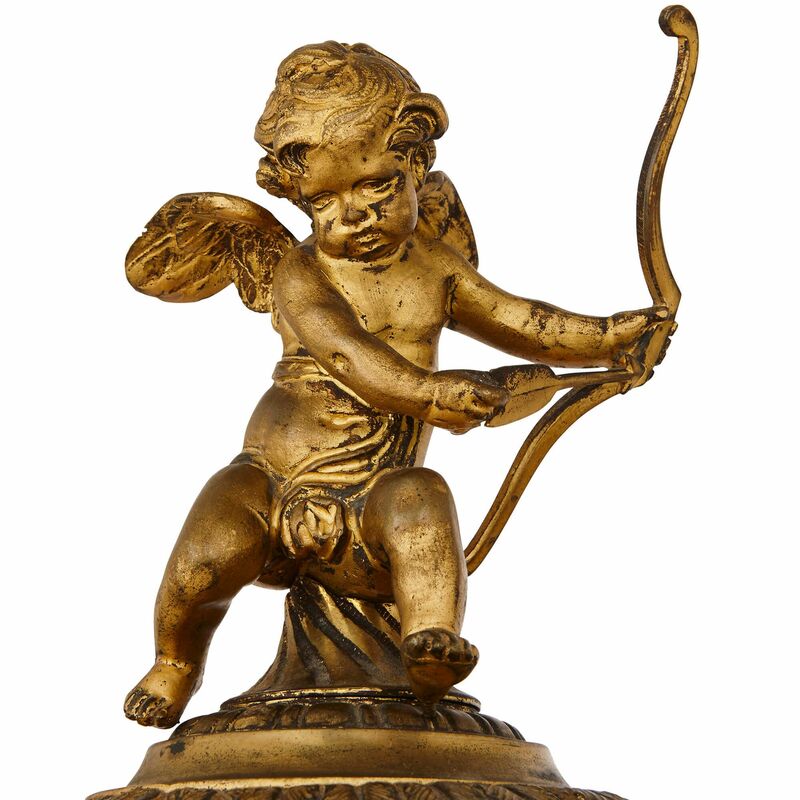 The central clock vase is distinguished by the large, ornately cast ormolu base upon which it is set, and the delicate ormolu cupid surmounting the cover. The base is of curved, rectangular form and features intricate fluting and geometric shapes all over, as well as stylised acanthus leaf motifs and two winged cherub termes set to either side, which each play a trumpet and terminate in floral scrolls. 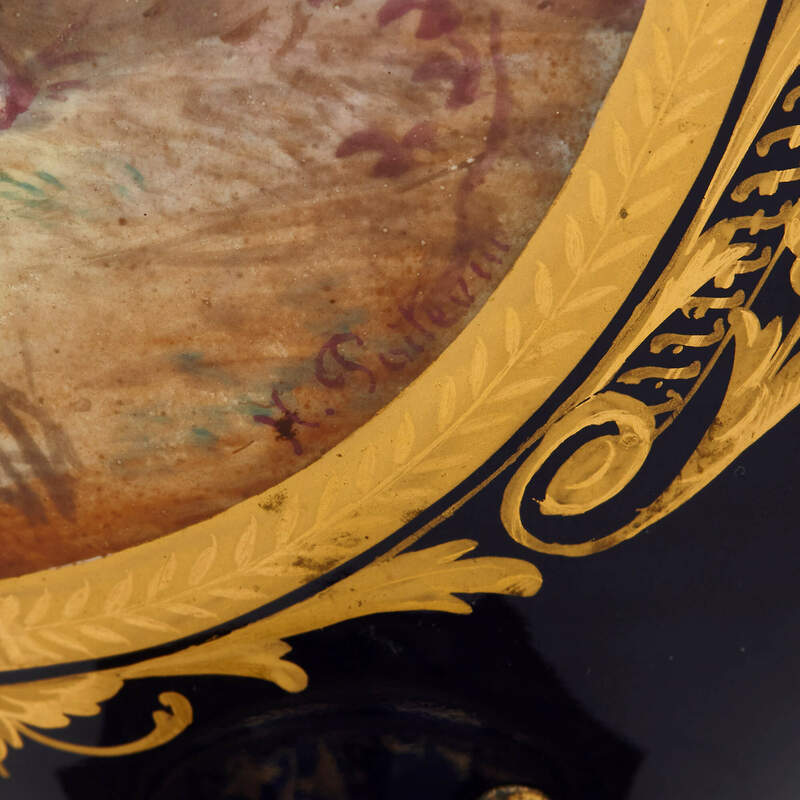 The ormolu stem supporting the clock dial is set onto the base and features decorative swags and acanthus leaf casting. 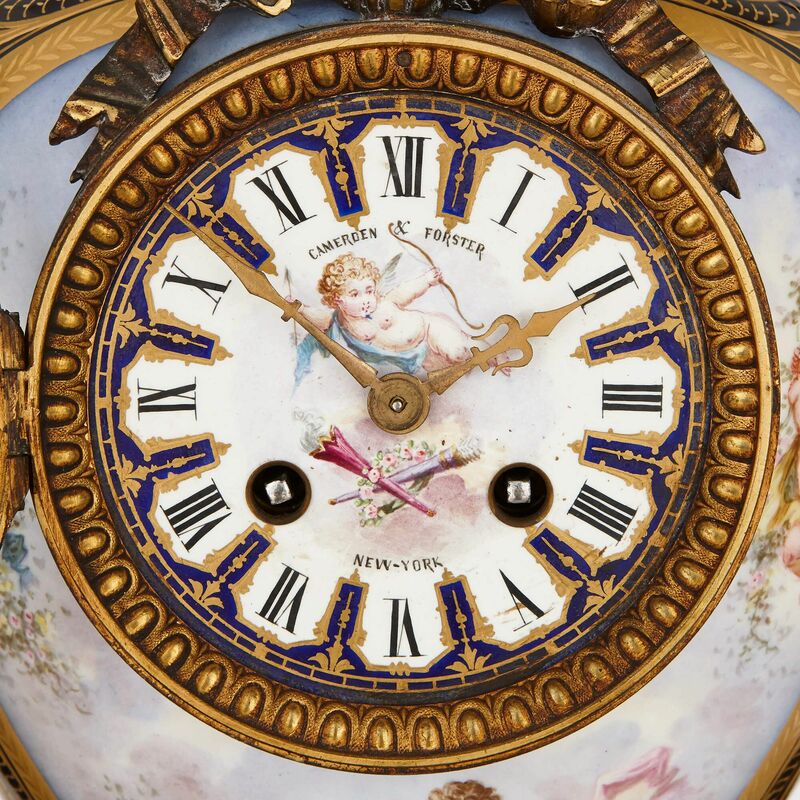 The porcelain clock dial, shaped as a vase, is centered by the clock face, which incorporates black Roman numerals in a circular formation, decorated to the centre with a painted cupid and flowers. The clock face is signed 'CAMERDEN & FORSTER / NEW-YORK', being the American retailers of the clock set. 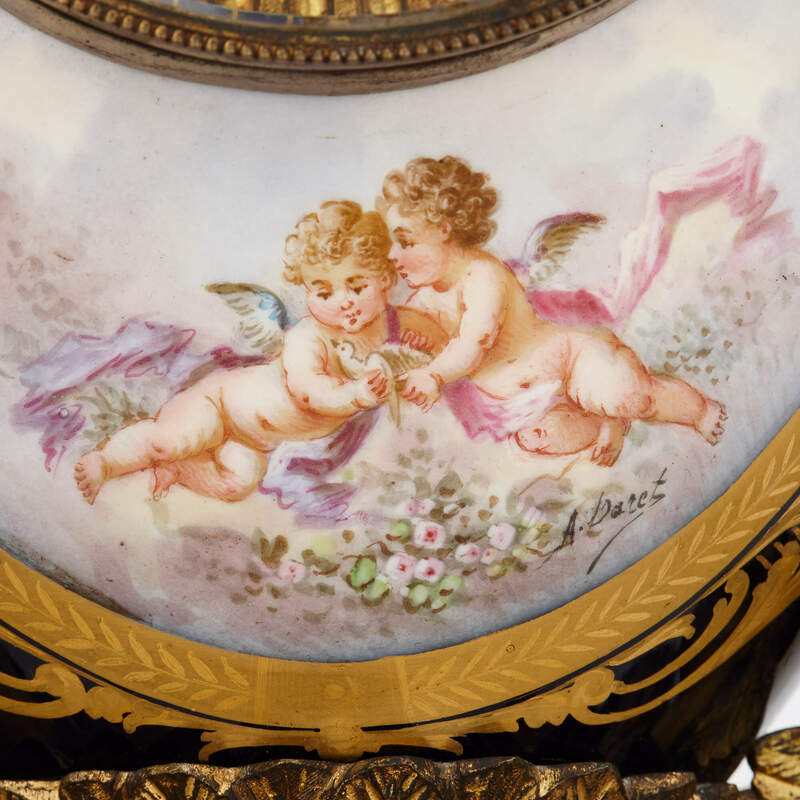 Surrounding the clock face, the vase is decorated with delicately painted compositions of flying putti and cherubs, framed within is scrolling gilt detailing and a royal blue ground. 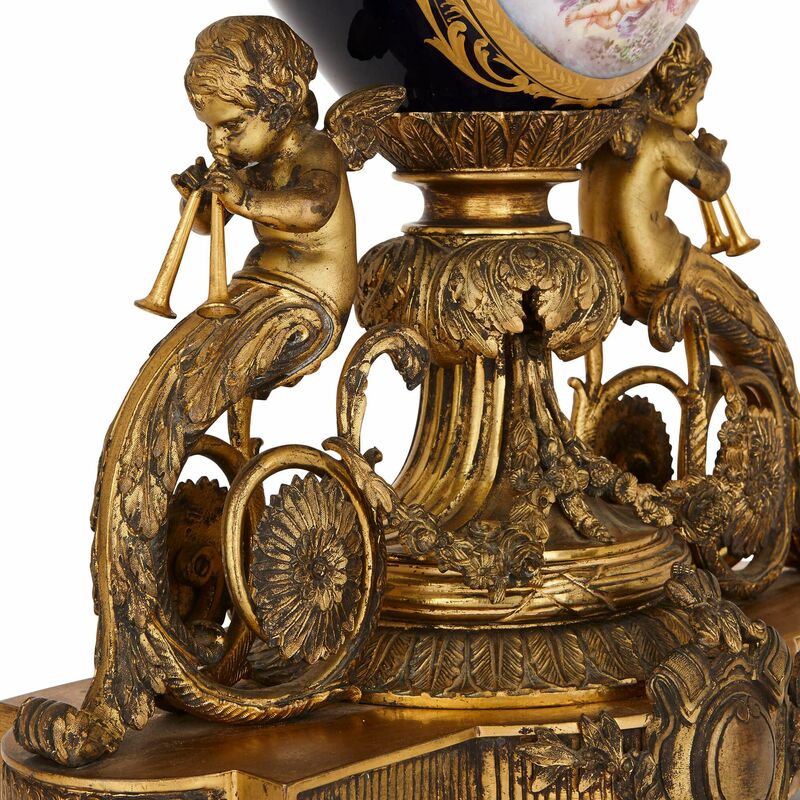 The vase is mounted with twin ormolu rams mask handles. 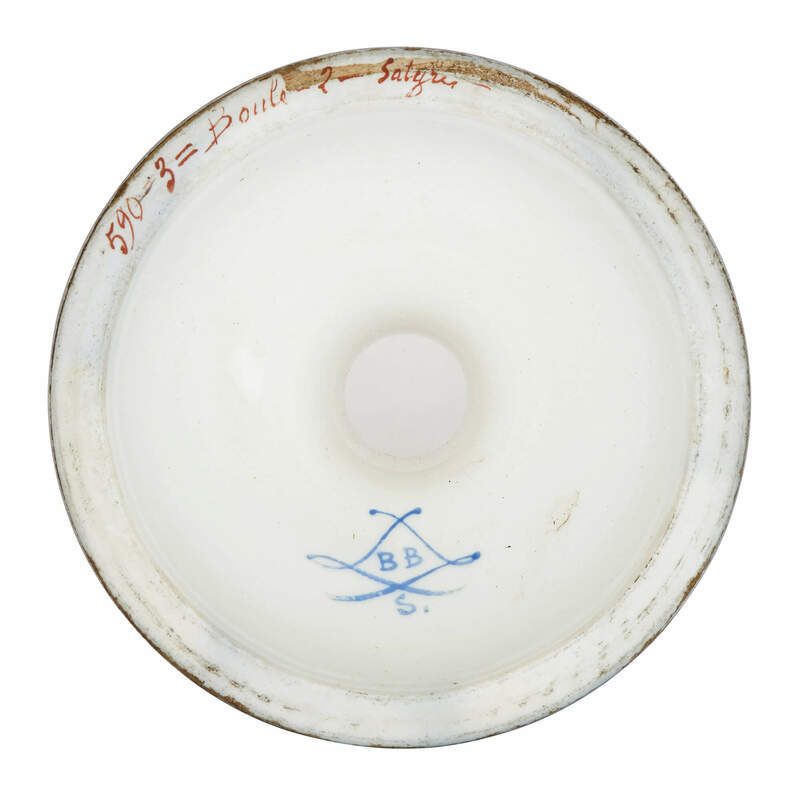 The pair of flanking vases are similarly decorated, featuring large painted scenes to the front showing detailed compositions of fêtes galantes - 18th Century courtship scenes in landscape settings - which are signed 'A Baret' by their decorator. 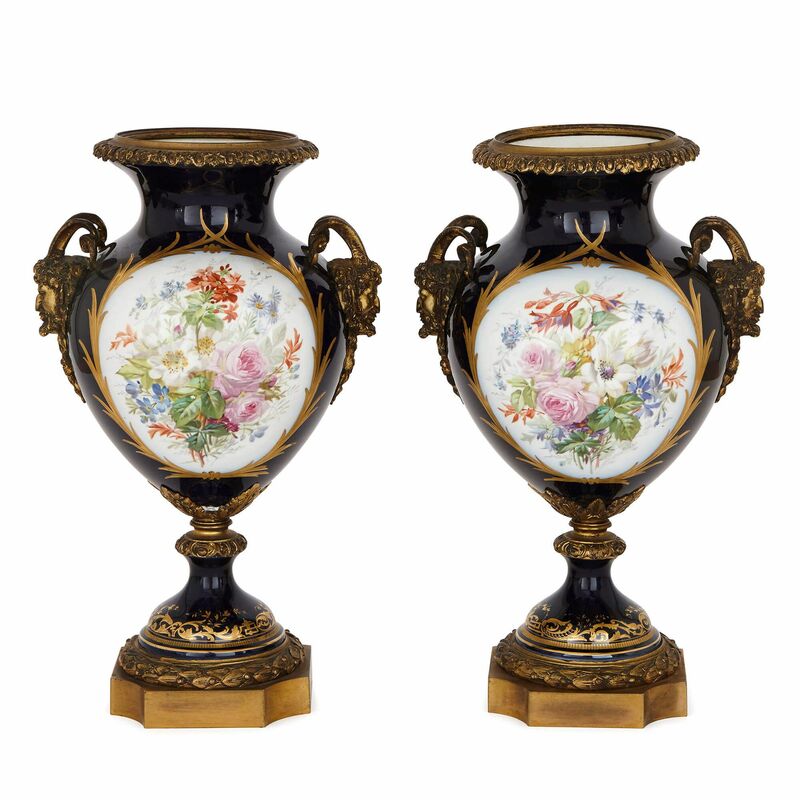 To the reverse, the vases feature floral compositions set onto a white ground, and are decorated all around with scrolling gilt highlights and a rich, royal blue ground. The flanking vases each feature twin ormolu handles of bearded Classical male masks, as well as ormolu banding to the flared rim, around the stem, and a large square-form ormolu base.